When the headlight(light switch in the headlight or AUTO position) is on and all doors (and trunk/tailgate) are locked and closed, the headlight, position light and tail light will come on for 15 seconds if any of the below is performed. Without smart key system When the door unlock button is pressed on the transmitter. With the smart key system When the door unlock button is pressed on the smart key. When the interior light switch is in the DOOR position and all doors (and trunk/tailgate) are locked and closed, the room lamp will come on for 30 seconds if any of the below is performed. With the smart key system When the door unlock button is pressed on the smart key.When the button of the outside door handle is pressed. When all doors are locked and closed, the puddle lamp and pocket lamp will come on for 15 seconds if any of the below is performed. 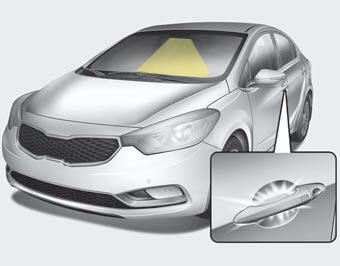 When the button of the outside door handle is pressed.When the vehicle is approached with the smart key in possession.